Air Pumps, Stones & Diffusers. Food - Pond / Koi. Liners, Sealers & Repair Kits. OCEAN FREE AQUARIUM SURFCLEAR SURFACE SKIMMER FISH TANK FILTER MARINE REEF SKIM. 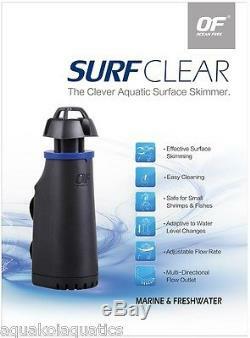 OCEAN FREE SURFCLEAR AQUARIUM SURFACE SKIMMER. The aquarium water surface may develop unsightly oil slicks due to fish waste. Uneaten foods and dirty air. At the water surface and the air above, which will reduce the amount of oxygen. Oil slicks also cause reductions in light penetration into the water. The Ocean Free SurfClear Aquatic surface skimmer can effectively remove any oil slicks and keep the water surface clean and clear. Comes Complete with attachable guard to prevent pellets or small fish from entering skimmer. Easy Sponge Cleaning: The innovative design allows you to pull the handle at the top of the telescopic inlet float and lift up the filter cup containing the filter sponge for cleaning, without your fingers touching the water. Strainer Adapter: A strainer adapter is provided to reduce the chance of small fishor shrimps from being accidentally sucked into the surface skimmer. Flow rate Adjuster: The turn handle design at the top of the telescopic inlet float allows you to adjust the flow rate of the pump without you fingers tounching the water. Telecscopic Inlet Float: Telescopic inlet float design allows for continuous all round surface skimming, at variable water levels up to 35mm. Multi-Directional Flow Outlet: The multi-directional flow outlet design lets the water diffuse out of the Surfclear body with minimum disturbance to the tanks main flow circulation. Removable Pump head: The Internal pump head can be easily removed for cleaning and maintenance of the impeller for a lasting usage. Dimensions: 45mm x 60mm x 135mm. New additions to the Aqua Koi; ranges are continually being sort and developed, and we will continue our strive to supply the most cost effective Pond, Aquarium and Pet related products available. Aqua Koi are now the Exclusive UK Wholesaler and Distributor of Kirameki Professional Japanese Koi Foods. For all information or trade account enquiries regarding Kirameki Foods, feeding plans and nutritional information on these superb top of the range Koi foods, please feel free to contact our sales team. We recommend you return goods to us using our own Freepost address included with every order. We cannot be held responsible for missing goods or items damaged in transit. Unit 1 & 2, 29-31 Dawkins Road Hamworthy Poole, Dorset. Unit 1, 29-31 Dawkins Road, Hamworthy, Poole, Dorset BH15 4JY. 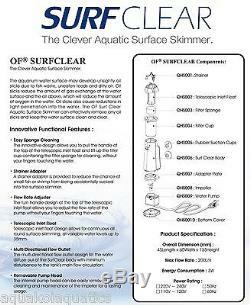 The item "Ocean Free Aquarium Surfclear Surface Skimmer Fish Tank Filter Marine Reef Skim" is in sale since Thursday, August 28, 2014. This item is in the category "Pet Supplies\Fish & Aquarium\Filters". The seller is "aquakoiaquatics" and is located in Poole. This item can be shipped to United Kingdom, Austria, Belgium, Bulgaria, Croatia, Cyprus, Czech republic, Denmark, Estonia, Finland, France, Germany, Greece, Hungary, Ireland, Italy, Latvia, Lithuania, Luxembourg, Malta, Netherlands, Poland, Portugal, Romania, Slovakia, Slovenia, Spain, Sweden, Australia, United States, Canada, Brazil, Japan, New Zealand, China, Israel, Hong Kong, Norway, Indonesia, Malaysia, Mexico, Singapore, South Korea, Switzerland, Taiwan, Thailand.